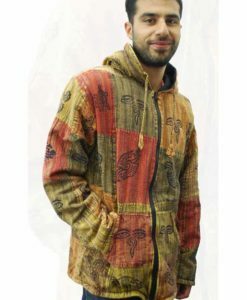 We have wonderfully magical range of hippie jackets & coats. 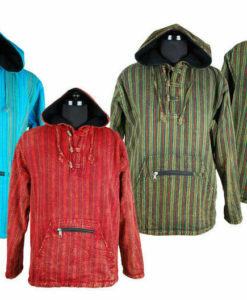 Warm & cosy wool coats for men, funky striped jackets with pixie hoods & funky patchwork jackets perfect for layering up round the campfire. With a wide variety of wool bearing animals existing in Nepal, woollen clothing items such as handknitted fleece lined jackets are becoming more popluar in the UK. 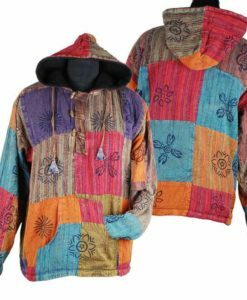 The women of Nepal make our warm, colourful hippy jackets and fleece lined hoodies based on both traditional Nepalese and classic western styles. They are available in a beautiful range of fashionable sizes and designs. Our Unique patchwork jackets are commonly seen being worn by people from many walks of life. Our bohemian coats & ponchos are a stylish way to keep warm and look smart. They are deceptively lightweight and made from super soft cashmelon.